What is HVAC System? Find Answers to All Your Questions! 1 What Does HVAC Stand for? 1.1 What is an HVAC System and What It Does? 3 How Do HVAC Systems Work? 4.3 How Much Does an HVAC System Cost? 4.4 Which HVAC Brand is Best? We have all heard someone using the term “HVAC” but have we paused for a second to think what exactly it stands for and what it actually means? No one should be ashamed to admit that the term is unfamiliar and the only thing that he or she knows about it is that it is often associated with air conditioning and heating companies. The abbreviation stands for Heating, Ventilation, and Air Conditioning. It is not necessary that you have combined systems. You may choose to have separate components. However, most people prefer to have connected systems in their home. One such example is a central heating and AC systems which use a single blower to circulate air, using internal ducts. As you now know what HVAC stands for, it is time to ask yourself what exactly it is, what it does, and how it does it. Luckily for you, we are here to answer all your questions. Let’s get started! 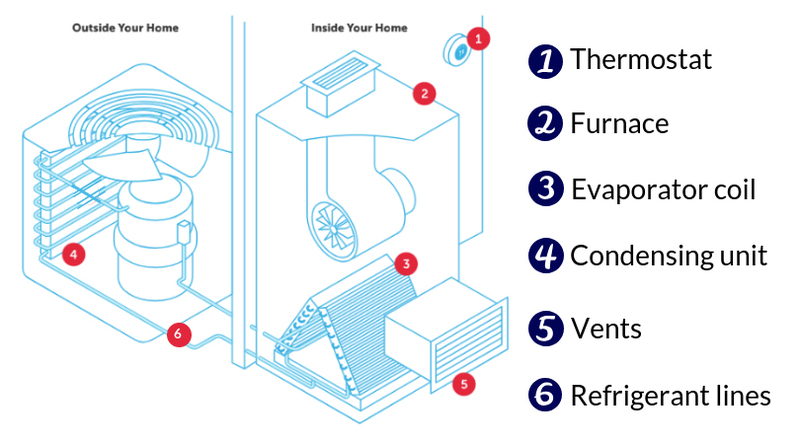 What is an HVAC System and What It Does? Generally, what HVAC refers to are the different systems that are used for moving air between outdoor and indoor areas, along with cooling and heating both commercial and residential buildings. These systems ensure that you feel cozy and warm during winter and fresh and cool during summer. Indeed, the primary function of an HVAC system is to maintain the air in your home at a comfortable level. However, these systems also clean and filter indoor air and keep the indoor humidity levels at a safe and healthy level. An HVAC system guarantees an even distribution of warm and cold air due to the series of ducts and vents through which the air moves. 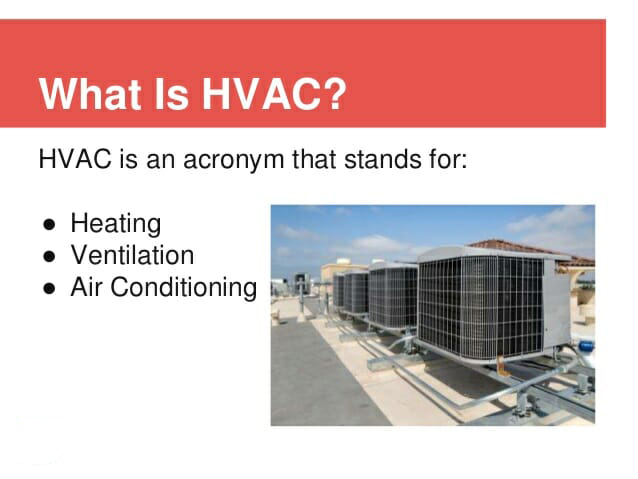 Indeed, heating, cooling, and ventilation are all lumped together in one acronym. However, they rely on different equipment and principles to work correctly and to keep you warm and cozy during winter and cool in summer. Generally, the heating components of an HVAC system is an electric/gas furnace or a heat pump. It could also be both if you use what’s called a ‘dual fuel’ system. The furnace does not only take the most space in an HVAC system, but it also uses the most energy. Usually, it is hidden in an area that is not used. A furnace has an ignitor and burners that are responsible for heating the air. It moves the air from the heat exchanger through the air ducts and then into the rooms of the building. In contrast, the heat pump pulls warm air from outside and then brings it in through the evaporator coil. They absorb heat from a cold space and release it to a warmer one because they work by moving thermal energy in the opposite direction of the one of a spontaneous heat transfer. A heat pump accomplishes the work of transferring energy to the heat sink, by using a small amount of external power. Ventilation is an essential part of the HVAC system as it not only moves air but it also removes harmful particles and excess moisture. All of the air ducts, exhaust fans, filters, and air vents are included in the ventilation system. The air moves from the heating or cooling appliance throughout the home using ducts. However, it is not enough for air to travel only one way. For the heating and cooling appliances to work correctly, the air must also move back to them. Vents accomplish this by using rectangular covers that direct the airflow back to the cooling and heating appliances. The main functions of an air conditioner are cooling and monitoring temperature through a thermostat. Still, air conditioning is also responsible for controlling humidity. Most of the HVAC systems have a split-system A/C. That means that part of it is outside and part of it is inside. The condenser and compressor are located outside, while the expansion valve and the evaporator are inside. Only five percent of the systems employ an oil furnace, most use a gas one. Gas furnaces range when it comes to efficiency – from 80 percent, which is better for warm climates to 98 percent which is a cost-effective choice in cold climates. The unit that is installed outside is the air conditioner’s condensing unit. The evaporator coil is a crucial component of this type of system and is typically mounted inside the cabinet of the furnace. By using refrigerant circulating and copper lines, the evaporator coil captures heat and send it outside. As air conditioner models also range in efficiency, if the climate you live in is warm, it would make more sense to set up an AC with a SEER efficiency rating that is high. People who live in hot regions where freezing temperatures are rare, tend to prefer this type of split system. Heat pump split systems, as their name hints, use a heat pump for both cooling and heating. In general, a heat pump works almost like an air conditioner with the difference that the heat pump’s operation can be reversed in cold weather. Instead of a furnace, this system uses an air handler with a blower motor. These are also called a hybrid or dual fuel systems. They are an excellent choice for cold climates. In a moderate cold, the heat pump is what supplies heat. When temperatures drop below freezing, and it is no longer possible for the heat pumps to work effectively, the system automatically switches to the gas furnace. These systems consist of an air conditioner or a heat pump that is placed outside. The air conditioner is used for only for cooling while the heat pump can be used for both cooling and heating. In ductless split systems furnaces are not an option. The indoor components can be installed on walls, floor or ceiling and use a fan to disperse treated air. Gas/electric – What this type uses are gas furnace and an air conditioner. Heat pump- The heat pump provides both heating and cooling. Hybrid- This type of packaged system uses a heat pump for all the cooling and some of the heating, and a gas furnace for the heating when the temperatures outside are below freezing. Don’t forget to check our roundup of the high-quality dehumidifiers for basement. These systems facilitate heating and cooling by using the stable temperatures of the earth. Water that often contains refrigerant is circulated through pipes that are installed in water or the ground. This way heat is collected and shed. The efficient dumping of heat during summer and collecting of heat in winter is facilitated by the consistently moderate temperatures of the ground. Like we already mentioned the purpose of an HVAC system is not just cooling or warming a particular space. In fact, a well-working HVAC system does way more. It improves the air quality of your office, home, or any other building and it also provides comfort for anyone that is in this building. While there are many different types of HVAC systems, they all have the same essentials. First, there is a source of air intake from within your home or from the outside. We call this process ventilation, and there are two different ways in which it can happen. Natural Ventilation –This type of ventilation is presented in most homes as they all have doors, windows, vents, and other openings. Natural Ventilation refers to the way air typically moves in and out through all of the above. If you want to remove unpleasant odors, carbon dioxide, and excessive moisture, or to replenish oxygen, then this exchange of air is something you must often do. Mechanical Ventilation- This is actually the “V” in HVAC as it refers to the automatic system we use to ventilate our home. In the past, natural ventilation was easily made because of all the cracks and gaps the constructions had, along with the opening and closing of doors. Nowadays, however, things are way too different. The modern homes are far more tightly sealed. Therefore, ventilation is an essential component in home HVAC systems. Once brought in, the air is drawn into an air handling unit. There it goes through filters that remove dust, dirt, allergens, and many other particles. After all that, the clean air is sent either to be heated or to be cooled and have excess humidity removed. When the air is finally fresh, clean, and at a comfortable temperature, it is directed into the house. If we talk about central systems, this means that the air will move through a network of ducts and registers to various rooms. For other systems, this means that the air will be directed right into space. With so many different systems you are probably wondering what you should choose for your home. That’s why we want to show you the pros and cons the most common HVAC systems have. They don’t create much noise: Since the mechanical components of packaged systems are placed outside, they are relatively quiet. Packaged systems cost less to install. They do not offer as many options as standard and ductless split systems. They are less efficient than other types. They wear faster than other HVAC systems: Since the units are installed outside, they can be left vulnerable to leaks, wind, and rain. It is possible that some animals make a home in the unit during the winter months. They offer a great range of options. The system is easy to control and operate. Split systems are energy efficient. Check out our roundup of the most energy-efficient air conditioners. They are versatile: You can install a split system pretty much anywhere. Traditional split systems can be impractical, as they require ductwork that is too costly. The system does not come to you charged. The exterior compressor of a split system air conditioner is too noisy. More laborious installation: The installation usually needs to be done by a professional. Before deciding on a particular type of an HVAC system, it is essential to know what exactly you are going to pay for the system itself, for the installation, maintenance and operating. Usually, this is the first cost a homeowner considers. The price of a new HVAC system installation can range from around $3,000 to $30,000 or more. There are many factors on which the installation cost depends- efficiency of the equipment, the are you live in, the size of your house, ductwork, etc. A good rule of thumb is that cheaper units are rarely a good option. Affordable systems typically mean low-quality systems. An installer that requires a low payment, most of the time means an inexperienced worker. If the installer doesn’t size your system correctly, it could cause significant issues. 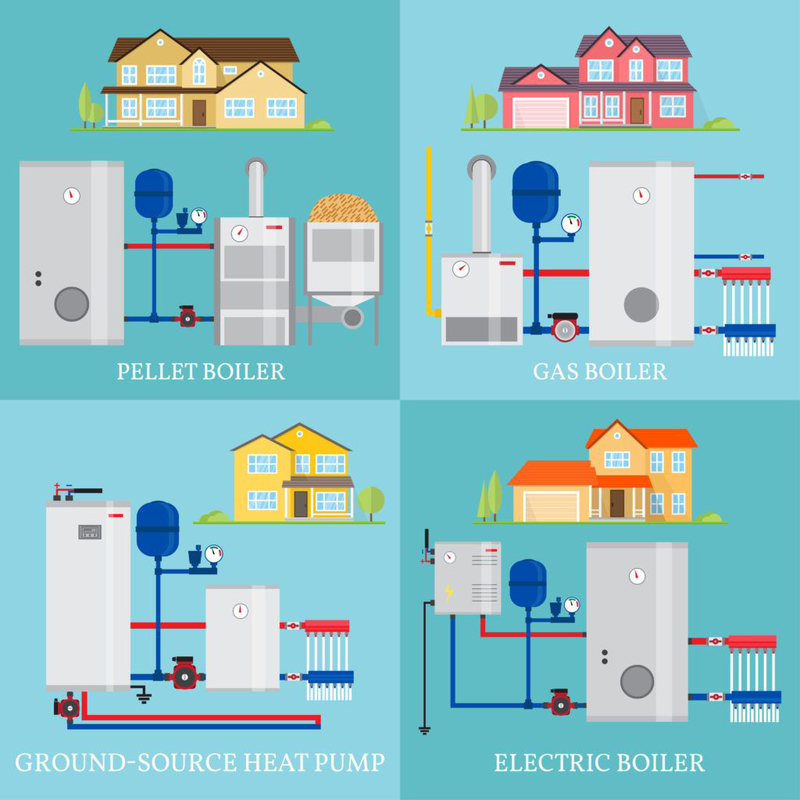 A furnace, a hot water heater, and an air conditioner are what a conventional system is made of. This means that you will have to maintain three different pieces of equipment. As this could get pricey, many people choose to have geothermal cooling, heating, and water systems. As heating and cooling are the most significant energy expenses for many homes, it is essential to make sure that your house is airtight and well insulated. Look for a high-efficiency heating and cooling system. The energy efficiency rating of such systems is measured in Seasonal Energy Efficiency Ratio- SEER. On the other hand, gas furnaces are measured in Annual Fuel Utilization Efficiency- AFUE. We would recommend finding a conventional air conditioner with 20 SEER and a gas furnace that reaches 95 percent AFUE as they are the most efficient. Geometrical systems also have efficiency ratings of 400 to 500 percent. If you don’t want to lose the heat you pay for, don’t choose a unit with a score that is less than 100 percent. The energy consumption that is required during combustion in a fossil fuel furnace is usually the reason for this loss. Keep in mind that the most efficient gas furnaces can’t compete with the high efficiency of geothermal systems. There is a cause that so many people buy Carrier AC units. As their HVAC systems are built with many strict quality standards in mind, Carrier is considered to be one of the top-of-the-line air conditioner brands. This brand offers many options so you will surely be able to find the exact central air conditioning system you want and need. Carrier offers the highest SEER rating on the market nowadays- 21 SEER. When compared to other HVAC brands, Carrier repairs are relatively affordable. So if you are on funds, you will surely love this brand. Carried is definitely a brand you can trust since it is one of the world leaders in heating, air- conditioning, and refrigeration solutions.